There’s nothing worse than rushing into something that you aren’t fully prepared for. The same goes for webinars. Take the time and thoroughly plan out every detail of your webinar. It will save you some serious headaches in the long run. Recording a dry run of your event is one of the best ways to ensure that your event will run smoothly. Be sure to test your equipment, check your content, and practice your speaking queues. Re-watching these recordings can help find any errors, as well as ease your nerves prior to the event. Keep your audience engaged by implementing polls and questions into your presentation. The more audience engagement, the more likely you will be able to disseminate your information. 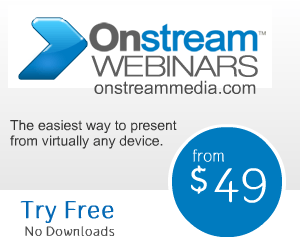 If you are looking for a completely browser based download free platform, choose Onstream Webinars. Onstream Webinars comes with over 100 features standard and is simple to use. Enjoy crystal clear audio and video with up to 500 participants. Click here to learn more.